St. Peter of the Field Catholic Church was founded in 1868. One thing I have noticed about both the Knapp and Kline families: the Church played a very large part in their lives – they lived very close to their churches. You can click on the thumbnail of a drawing below that was created by Albert J. Paulus in 1971 and shows the area known as Johnnycake Hollow. I have marked St. Peter of the Fields Church on the hand-drawn map (#1). 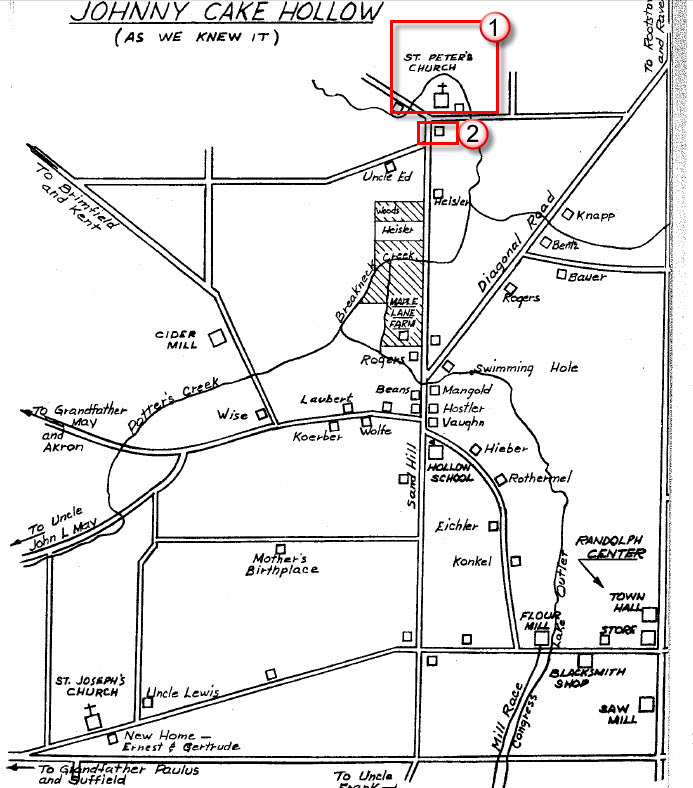 The approximate location of the Kline farm is also shown (#2). 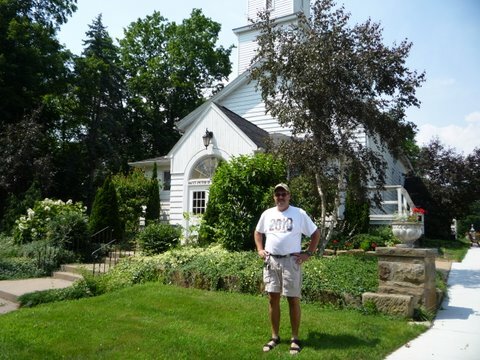 If you read Uncle Don Knapp’s account of his time spent on the farm, then you know that Henry C. Kline was the sexton at St. Peter of the Fields Church for many years. He would arise at 4:30 a.m. and stoke the furnace every Sunday so the parishioners would be warm during Mass. And thanks to Gary Knapp for supplying the photo of the stained glass window donated by Mr. and Mrs. Henry C. Kline. I have never had the opportunity to see the inside of the church – so thanks, Gary, for sharing this photo. Gary was pretty busy this week with plans for the 2010 Reunion, yet he still found time to shoot some photos of St. Peter of the Field and at St. Joseph’ s in Randolph. You can check out the rest of Gary’s photos in the Photo Gallery section of this blog. Gary managed to get some photos of family tombstones, too. 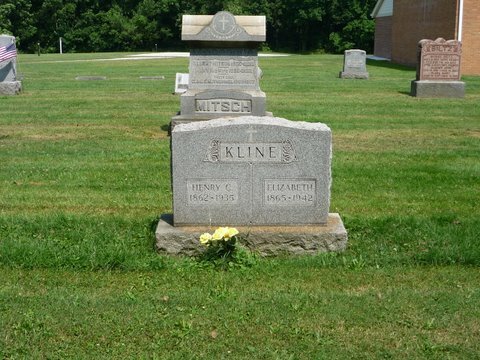 Below are photos of the tombstones of Henry C. Kline and his wife, Elizabeth, in St. Peter of the Field Cemetery. Gary also shot pictures of Knapp family tombstones – these are located in the Photo Gallery section, too. Below are a few facts about the cemetery. Established in 1867 with the first burial, this cemetery was dedicated holy ground for the Catholics of the parish of St. Peter of the Fields Church. The Old Section started in 1867, the Sacred Heart in 1941, and the Holy Angels, the newest section named in 2002, made up the resting grounds. A shrine and altar were built in 1941 and were re-built larger in 2001 to accommodate mass celebration there. A new church was established in 2006. Margaret Kline: Daughter of Peter K. Kline and Margaret Gatlin. She born 17 June 1843 in Randolph Twp., Portage, Ohio. Died 30 July 1925 in Rootstown, Portage, Ohio. Married a Knapp, but I don’t yet know her husband’s first name. Margaret is the first cousin once removed of Florence Cora Kline Knapp. Henry C. Kline: Father of Florence Cora Kline Knapp. Vernon J. Kline: Brother of Florence Cora Kline Knapp. George Kline: Born 28 Aug 1859, Died 9 Feb 1883. Was a first cousin once removed of Florence Cora Kline Knapp. John B. Kline: Born 5 April 1860. Died 11 Sep 1923. Was a first cousin once removed of Florence Cora Kline Knapp. There are a lot of other ancestors buried there. It’s worth a trip for anyone interested in genealogy. You can read more about “Growing Pains in Johnnycake Hollow” by clicking the link at the bottom right column of this page under the heading “Blog Roll.” You will find a link to Albert’s account of his growing up years in Johnnycake Hollow. See another photo of St. Peter of the Fields and read more about its history and architecture by visiting a site called Sacred Landmarks. Sacred Landmarks is a site created by two former Wayne State University professors with an interest in historic churches. This entry was posted in Family History, Local History, Maps, Ohio Churches, Photos, Portage County and tagged Kline, Knapp, Ohio, Rootstown, St. Peter of the Field Church. Bookmark the permalink.